It may seem insane in the thick of a suffocating Texas summer, but I started playing tennis with my husband recently. We both spend a lot of time at our desks every day and wanted to start a new healthy habit together. I was skeptical when he first suggested tennis as an afterwork activity to take up. I am a deeply uncoordinated person, and I am also pretty apathetic when it comes to participating in sports (I am not a competitive personality, Jeff is the complete opposite). I thought maybe this could be my opportunity to hone the cat-like reflexes I never had. During our first game I realized that this would probably take decades to develop or more likely never happen at all, as I struggled to hit the ball even just a few times. Still, I was surprised at how much fun we had and we worked up a great sweat. I’m slowly but surely getting better now and I’m enjoying it all the while. I used to watch Dynasty all the time and they were constantly playing tennis in amazing outfits. I love that preppy tennis look, and after playing one game of tennis, I started dreaming of wearing chic tennis outfits on the court. Surely this is one of the best reasons to play tennis. I tried on a look at Tory Sport (we have a boutique here in Dallas now) as a lark, and I posted a picture of it on my instastories. I asked if it was ridiculous to buy a tennis outfit if you’ve only played a few games and were really bad at it, and I was very surprised to receive a deluge of messages from readers who insisted that having the right gear made you a better player. I like these readers’ style. 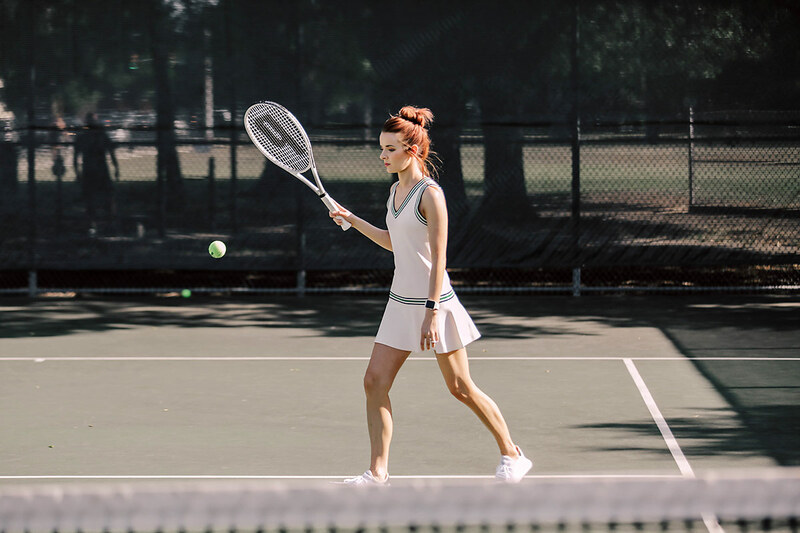 It was all the encouragement I needed, and now when I wear my chic Tory Sport tennis dress, I do feel like I play much better. I love the tote bag I got too, which has a rack holding attachment you can use or tuck away. It’s quite large so I plan on using this as a weekend bag as well. If anything, the possibility of owning more Tory Sport tennis outfits will keep me motivated to stick to playing. I love every Tory Sport but I hadn’t looked at the tennis gear much until recently. There are some seriously cool outfit possibilities to be had there. Here is a special memory I have: you know how sometimes you see someone so stylish and cool, the memory of them stays with you forever? Quite few years ago Jeff and I were out having drinks at a patio bar one autumn evening and in walks this women who was probably in her early forties, wearing a sleeveless cable knit tennis sweater with hip hugging blue jeans. She had a really cool cropped haircut and beautifully sculpted arms (please tennis, give me these arms?). She wore her preppy tennis sweater with such irreverence, and I have never seen anyone look so cool drinking beer on a patio. When it gets cool enough to wear a tennis sweater, I definitely want to invest in one like this.